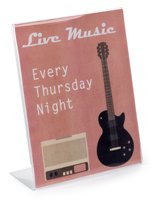 This Picture Frame is Affordable and Ideal for Displaying Photographs, Newsletters, Menus, and More! Shop for other Photo Frames Online! Thousands are In Stock and Ready for Immediate Shipment! 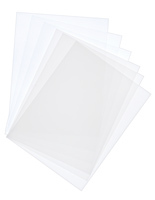 3.5" x 2" 4" x 5" 4" x 6" 5" x 7" 5.5" x 8.5" 8" x 10"
Picture Frame in Acrylic with Frosted Edges, 8-1/2" x 11"
This economy ASH8511UP frame has "frosted" edges to the display, rather than edges that are polished, optically clear and shiny (see ASH8511). This ASH8511UP version saves you 40 cents per unit as we bypass extra labor and eliminate the edge polishing shop effort. The frosted edge is not a rough edge, it is simply not clear and shiny. This economy version is also a thinner gauge material (.080 thickness), in comparison to the upscale stock unit with .10 thickness. Most observers can't distinguish between the two styles. 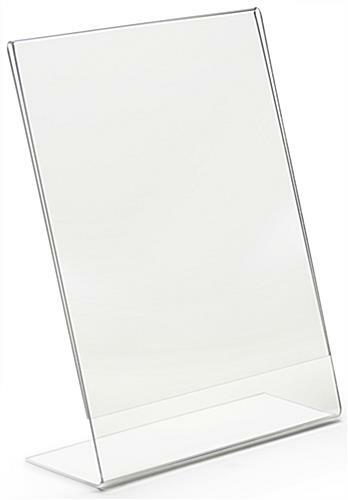 This picture frame is a popular economy, alternative version of our 8-1/2" x 11" angled, upscale countertop polished edge unit. This model is outstanding as an preference for higher quantity requisitions and frames that aren't being located in total, upscale environments. 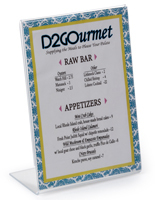 Again, we consistently manufacture this thinner, "frosted" edge version for larger retailers in requisition to save them the extra cost. 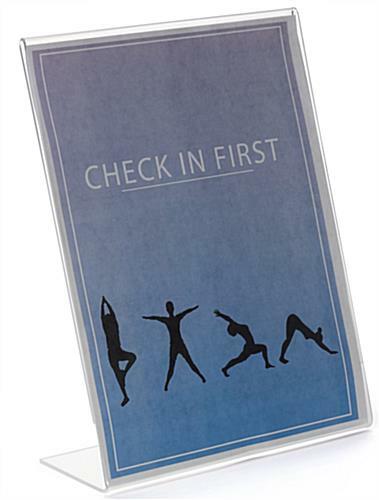 This economy picture frame's total dimensions are: 8-1/2" wide x 11" high to accommodate a standard sheet of paper. Steadfast 3" back base. Slide paper in from the sides for fast changes.